Following the acknowledgments and the foreword by Dr. Fasano, comes the preface—a brief but eye opening section that further explains Jules’ motivation for writing Free For All Cooking. Did you know that the eight major allergens that must be shown on food labels per the Food Allergen Labeling and Consumer Protection Act, which became effective January 2006, account for 90% of all “allergic” reactions? Of course, those of us who are gluten free sure wish that manufacturers were required to show “gluten” on the label versus only wheat. An establishment of the requirements for a “gluten free” label could potentially resolve that problem, but years have passed since that was supposed to happen. However, I digress. The next section of Free For All Cooking is Part I, Essentials of Gluten-Free Cooking. This 26-page section is a gold mine of information with specifics not only on gluten-free cooking, but also guidance on cooking free of other allergens. Jules offers substitutions for dairy, eggs, soy, and nuts. This section is also where Jules provide her all-purpose gluten-free flour mix recipe that can be used for the recipes that require flour. Note that this recipe is not identical to Jules’ flour mix that is available for purchase; that flour mix contains Expandex, modified tapioca starch (note that modified in this case does not mean genetically modified). She does state that her retail all-purpose flour mix may be used in all recipes requiring flour, but she did not simply state that as a required ingredient with no other options; which I think is admirable. And, finally, here’s the recipe I did make, Coffee Cake. Jules’ version actually includes brewed coffee (a coffee cake that includes coffee—clever! ), brown sugar, and streusel topping. I opted to use palm sugar in place of brown sugar and skipped the streusel topping, going for just a sprinkle of cinnamon and sugar (palm sugar) instead. I also used my all-purpose gluten-free flour mix and used almond flour instead of mesquite flour. The cake came out with a nice rich flavor, but was just a tad dry. I’m certain that was all because of my changes though. Next time (which may be this weekend for my support group’s tea event! ), I’ll use a bit of honey with the palm sugar for some added moisture and stick to the streusel topping, perhaps using honey instead of brown sugar. I expect that the results will be more like Jules’ original version—in other words, scrumptious. Preheat the oven to 350 degrees (static) or 325 degrees (convection). 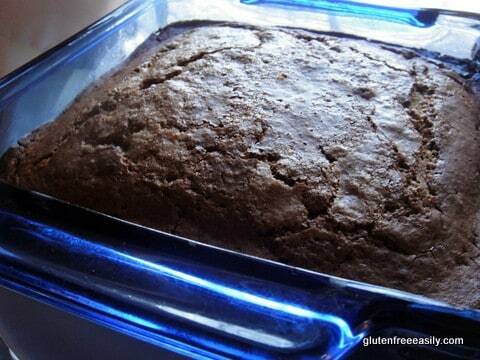 Oil or spray an 8 x 8-inch baking pan. Mash the banana in a medium-size bowl. Pour coffee over the banana and set aside. Beat the sugar and butter together in a large bowl until light and fluffy. Add the eggs and vanilla and combine well. Mix in the mashed banana and coffee then gradually stir in the remaining ingredients, mixing until thoroughly combined. In a small bowl, stir together the topping ingredients with a fork. Crumble over the cake, then cut through the topping with a butter knife in a crisscross fashion lengthwise, then crossways, feathering the topping in the top of the batter. Bake for 40-45 minutes, or until the edges are lightly crisp and a cake tester inserted in the middle comes out clean. UPDATE: This giveaway is now closed. Congratulations to Kristin (Slightly Irritating & Inconvenient)! Thanks to everyone else for entering and remember that your entries are still eligible for the final giveaway. More on that soon! ~Check out Jules’ blog and find a recipe you’d like to make. Leave a comment telling us which one. ~Follow Jules on Twitter. Leave a comment saying you did so. ~”Like” Jules on Facebook. Leave a comment saying you did so. ~Share this giveaway on Facebook. Leave a comment saying you did so. 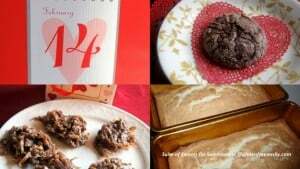 As you might have anticipated from the other posts in the SSS event, I’ll be offering another copy of Free For All Cooking that I purchased as part of the final giveaway package for Suite of Sweets for Sweethearts. That package includes the Cook IT Allergy Free app and the Go Dairy Free book as well. ALL comments on the Suite of Sweets posts will be entered for the final giveaway package, so get as many entries as you can by following the guidelines above! Full disclosure: The copies of Free For All Cooking were provided free of charge; however, this is not a paid review. The opinions expressed here are strictly my own. Hey Ricki–Wow on the name … great minds, huh? Well, you’ve always chosen awesome names, so I’m sure you’ll come up with another one for your next cookbook. 😉 Thanks for entering the giveaway! Yay for coffee cakes that actually use coffee! For the longest time I got confused whenever I saw a coffee cake that didn’t have it as an ingredient (took me a while to figure out it’s a cake meant to have with coffee, haha). Anyway, mesquite flour is one flour that’s intrigued me deeply for a long time now but I haven’t found it anywhere yet except online. I’d love to try it, though! The Coffee Cake looks great and I plan to make it! Thanks for the review as well! Hi Melanie–Thanks for all the entries! Hmmm, wish I’d thought of that biscotti recipe earlier myself. Would have been great for our tea event tomorrow! Thank you for the recipe! It sounds yummy & I can’t wait to try it because I love coffee cake! Hi Vicky–It looks like you are new to gfe–welcome! I’m so glad that Jules and her publisher allowed me to share the recipe with all of you. 🙂 Tomorrow, I’m making it with the streusel topping! Please enter me in the giveaway for a copy of the Free for All Cooking giveaway. thanks! Sounds like a good book to have! Hi Lucinda–Welcome to gfe! 🙂 Thanks for entering the giveaway … I think you’d really like Jules new book! Yum! I’m always really interested in what substitutions people recommend using for allergen free cooking/baking, so it makes me really happy that she has a whole section devoted to it! Hi Christine–Always nice to see you! I thought that whole section was really helpful, a great prelude to the actual recipes that were “free for all.” 🙂 Thanks for entering! I would love to try her pumpkin cornbread – I love pumpkin and cornbread, so together they should be amazing! I would like to try Jules Crescent rolls and red velvet cupcakes. Hi Niv!–Now those two do sound really good, don’t they? 😉 Thanks for entering the giveaway! I just tried a sample packet of Jules’ all-purpose flour a few weeks ago and it performed beautifully. I’d love to win her cookbook. Hi Nicole–Welcome to gfe and thanks for your entries! 🙂 Jules’ flour mix is really terrific, isn’t it? 🙂 Thanks for entering the giveaway! I’ve liked Jules on Facebook as well. I’d like to try Jules’ Red Velvet Cupcake recipe. I JUST LOVE COFFEE CAKES. I AM A PASTRY PERSON FOR SURE. I WOULD LOVE TO MAKE JULS COFFEE CAKE. Hi there Carole!–Looks like I made your recipe choice very easy. 😉 Thanks for entering the giveaway! would love to get this cookbook! I love Jules’ blog (as well as GFE)! Can’t wait to learn more about the GF kitchen! Hey Alena–Nice to meet another fan of Jules! So sweet of you to say that about both our blogs. Thanks for entering! Hi Shirley. This really does look amazing. Thanks for reviewing it in such detail. So insightful, as always. ;-). Crescent rolls? Red Velvet Cupcakes? Coffee Coffee Cake?? Oh, my!! I would love to win this cookbook. I will be making the Coffee Cake tomorrow, for sure. Hi Arleen–So nice to see you again! I knowwwww … it’s so hard to choose, isn’t it? 😉 Hope you enjoyed the coffee cake! Hey Jessie–It’s been a VERY long time, dear … so great to see you! 🙂 Sounds like you are in on the coffee cake secret. 😉 Have you every had coffee in savory dishes? That can be amazing, too. I might share one eventually … Thanks for entering the giveaway! Learning to cook Gluten and Dairy free. Need all the help I can get-would love to win the book. Hi there, Gina–Nice to see you again! 🙂 Thanks so much for entering the giveaway. Jules is a great resource for gf/df as well as so many others. Hope you are finding them all in the blogosphere! This is a great cookbook. I have enjoyed several recipes from it. I love cookbooks and would enjoy making the recipes in this one. that looks great. We made the brownies, but now I’m tempted by the coffee cake! Hey dear Cheryl–Another reader endorsement of Jules’ recipes—thanks! Coffee cake is so enjoyable. 🙂 Thanks again for featuring me in your Best of Best blogger series … I’m truly honored! Yummy looking cake, but I would have to add the topping for extra yumminess! InTolerantChef–You are not alone in your desire for the streusel topping! 🙂 I will be making Jules’ original version for our tea event today. I might add some walnuts or pecans though, as we don’t have anyone with allergies to those in our group. Thanks for entering the giveaway! This would be great to win. I’m always looking for new and delicious GF recipes. Hi Karol–Nice to see you at gfe again! 🙂 Yes, I agree on that pumpkin hummus … a must try for sure. Thanks for entering the giveaway! Hi Shirley, thanks for the welcome back. Yeah, I definitely plan to try that hummus fairly soon. I’ll let you know how it turns out…with my cooking skills, it’s a toss up whether it will come out tasty or awful. I’m still learning lol. I already follow Jules on Facebook. The pumpkin hummus sounds amazing. I will definitely be trying that recipe. A coffee cake with coffee…topped with streusel topping (a must in my books), I definitely want to make this cake! Can’t wait to see what other goodies are in that book! Hi Jeanine–Yes, you’ve spelled out the goodness re: Jules’ coffee cake! 🙂 You are such an accomplished baker, I can’t imagine you having difficulties with muffins. Must be an anomaly. 😉 Thanks for all your entries! I’d love to try Jules blueberry Muffins recipe…love blueberries, I just never have much luck with muffins. I “Like” Jules on FB as well. I’ve relayed the message via facebook as well! Would LOVE this… Jules recipes are the BEST!!! Hi Bonnie–Welcome to gfe! It’s so nice to meet another Jules’ fan. 🙂 Thanks so much for all your entries. Try Jules’ pizza for sure and you might also want to try my flourless gfe pizza; it’s very popular. 😉 There can’t be enough good gf pizza, right? Fingers crossed that I’ll be lucky. I don’t own any gluten free cookbooks yet. I “liked” you on facebook..
Hi Susan–It looks like you might be new to gfe–welcome! 🙂 Thanks for entering the giveaway! Having a resident celiac & other family members with other food allergies, this looks like a great addition to our resources. Hi Suz–Welcome to gfe! 🙂 Jules’ new cookbook would indeed be a great resource for you and your family. Thanks for entering! Hi Kristin–Welcome to gfe! 🙂 Love the name of your blog, Slightly Irritating and Inconvenient … too cute. And, the post on the stork landing was a good one; many of us could identify with that one! Thanks for all your entries. I already have Jules’s great book, so no need to enter me, but you did a fabulous job with that coffee cake Shirley! That is actually the second GF coffee cake with coffee in it I have seen this week. I’d love to win! I’m still learning since I’ve only been GF since October. I’m also dairy free for the most part. This recipe sounds fantastic! Would love to have the cookbook! Hey Stacy–It’s good to see you again! 🙂 Made this recipe again today for my support group’s tea and it was loved. 😉 Thanks for entering the giveaway! I follow Jules on Facebook! I would LOVE a copy of Jules’ new cookbook! My 6 year old daughter is on a very restrictive diet (GF,CF, egg, soy, peanuts), and I would love to use some more of Jules’ recipes when cooking for her and my entire family. Hi Sheri–Welcome to gfe! 🙂 You’re right .. this would be a great cookbook for you to have to ensure great, safe recipes for your daughter and your family. Thanks for entering! Hi Florence–Sounds like the Real Red Velvet Cupcakes are a great choice for you and your other half! 😉 Thanks for entering the giveaway! I already follow Jules on Twitter. I “liked” Jules on Facebook. Shared the giveaway one Facebook! Shirley, no need to enter me in the giveaway. Thanks for linking to my review. The cake looks tasty–I haven’t tried that one. Coffee is a common ingredient in chocolate cake which I have used many times, but not always. You usually can’t taste it, but it gives the cake a little kick. A thorough review as always! I follow Jules on Facebook – am a big fan of her other recipe books and her mixes and all purpose flour. Hey Jane–It’s great to meet another Jules fan. 🙂 Thanks for entering the giveaway and welcome to gfe! Just last week I sat across the table envious of my boyfriend as he devoured a huge portion of moist, blueberry coffee cake. I can’t wait to try this recipe! Thanks so much!! Hi Dawn–Looks like you are new here … welcome! 🙂 Thanks for entering! Have been enjoying Jules’ flour and blog for awhile! Looking forward to checking out yours some more! I plan to make Jules cupcakes with her chocolate frosting. Hi Jessica–Welcome! Hard to beat cupcakes. 😉 Thanks so much for entering the giveway! Hi Linda–Welcome to gfe! Wow on all the reviews you are sharing on Jules’ cookbooks and recipes. 🙂 I know she’ll be thrilled. Thanks so much for entering! I just saw her Challah on the back of the Free For All cover – that looks amazing! I might have to try that one tomorrow, too! With Jules’ flour and her fantastic recipes and advice, there’s no ‘giving up’ anything. It’s so wonderful! I follow Jules on Facebook! I get her blog and love her recipes.. I think I have every book, e-cookbook ,,, Kindle version of her book, though not the paperback! Would love to add it!! Ohh! I will make this coffeecake one day, last night, I made Jule’s recipe for sugar cut- out cookies, for my son’s activity last night. He loves them!! Another awesome review for Jules! 🙂 Welcome to gfe and thanks for entering the giveaway! I follow Jules on Facebook! I love her recipes and her GF flour which has made it possible for me to make many of my old recipes again. My family even likes it! Hi Wendy–Looks like you are new here … welcome! Thanks so much for all the lovely feedback on Jules, her recipes, and flour! Making the pancakes this morning! YUM!! I follow Jules on Twitter. How exciting! 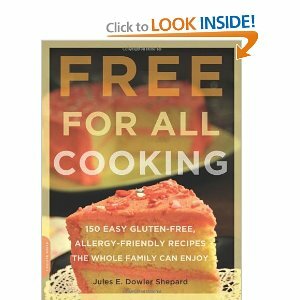 I can’t wait to get a copy of Jule’s new cookbook, Free For All Cooking!! Hi Dawn–I think you’re a gfe newbie–welcome! 🙂 Great testimonial on the birthday cake … thanks so much for sharing! My son turned 11 yesterday. I made Jule’s “Chocolate Birthday Cake”, and everyone loved it! The best part was I could eat b-day cake with my family! Thank you!!! Posted this giveaway on Facebook! And I added it to my blog. What a great review of Jule’s book, Shirley!! And I will totally be trying that coffee cake. I love how you pour the coffee over the banana. I can only imagine what a unique flavor that gives this cake. And you are right! imagine a coffee cake that ACTUALLY has coffee in it! LOL I love it! That never made sense to me that most coffee cakes do not even have that as an ingredient! I love cookies so I’m going to make those cut out sugar cookies very soon! Hi Yvonee–I think you’re new here–welcome! 🙂 Hard to beat cut out cookies … thanks so much for entering the giveaway! I think Jules is a super person. I wish I could use her mix as it would make baking easier for me. I think she and I are going to jump on board the baking for hunger with a gluten free twist. Her cookbook looks good too. I love it when a new book’s recipes gets a good test, always lets me know what to expect. This book sounds scrumptious! Thanks for sharing. I can’t wait to try the cake! Hi Heather–Welcome to gfe! 🙂 Thanks so much for entering the giveaway for Jules’ great new book! I ”LIKED” u on facebook! im just beginning to look at the site but so far see a bunch of recipes i want to try……and the flour also! :O) thanks! Hey Missy–Welcome! 🙂 Thanks so much for entering the giveaway and the Facebook connection. Glad you are seeing things of interest on Jules’ site! Looks like a great cookbook..would love it.. I would love a cookbook to give me direction in becoming GF. This sounds wonderful. Hi Dorie–Welcome to gfe! 🙂 It’s nice to meet another Jules’ fan and thank so much for the Facebook connection! Love her Blog as she has a wealth of info and research. The gf sugar cookies sound awesome! Hi Diane–Welcome to gfe! 🙂 Glad you found an awesome recipe you’d like to try and thanks for entering the giveaway! I read Jules’ blog and follow her on facebook. Her fruit cobbler recipe is just like I remember fruit cobbler tasting when my Mom used to make it! Her flour blend is better than any I’ve used in GF years. This was a great review and I can’t wait to buy on a copy of this new cookbook (though I would love to win one). I’m going to share this on facebook; thanks so much! Hi Gypsi–Welcome to gfe! 🙂 It’s so nice to meet another Jules’ fan and hear such a great testimonial on her recipe and product. Thanks for entering and sharing the giveaway with others! Great review. Can’t wait to try the recipe and get the book. I’ve been considering trying Jules flour, but haven’t yet. Sounds like it would make life easier. Hey, I LOVE Jule’s flour! It’s the BEST one I have found after trying a bunch, including making my own. I love the coffee cake recipe! YUMMY! This coffee cake sounds delicious!!! I love her flour! I just made her yellow cake/chocolate icing & tried an experimental cinnamon cake last week & my family ATE IT UP! 🙂 So glad I found this flour & a few of her recipes…they have been a life saver! Hi Amy–Welcome to gfe! 🙂 Another great testimonial for Jules’ flour and her recipes … thanks so much for sharing and entering the giveaway! 6 years ago I found out that my 18 month old extremely sick son had a completely manageable disease, celiac disease. Jules flour made cooking normal again. Thanks for the impact she made on our lives. Thanks for spotlighting her work. Hi Wendy–Welcome! I love how you emphasize the positive in your wording–“a completely manageable disease.” Another great testimonial to Jules; I’m so happy to share her new cookbook by doing my review. Thanks for entering, Wendy. 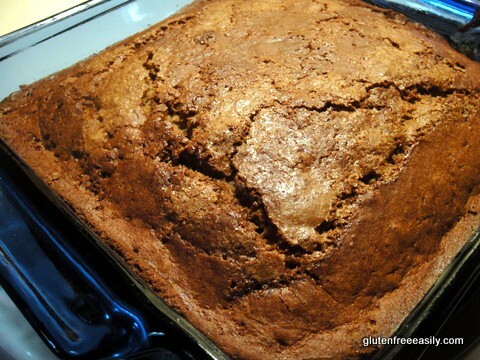 I will make this coffeecake real soon, maybe this afternoon! :-). All the recipes listed in Free For All Cooking sound awesome! I have most of Jules other cookbooks/ebooks and use her recipes often. Thanks Jules for all your efforts and dedication to gluten free and allergy free cooking. I share your website and recipes with many people. Hi Kathy–Welcome! It’s so wonderful to hear all of these great reviews of Jules and her work! Thanks so much for entering. I haven’t tried Jules flour yet…keep wanting to do so and this could have me taking the plunge! I want to try the Red Velvet cake and the cut-out sugar cookies at Jule’s GF Blog. Hi Kim–Welcome to gfe! 🙂 You’ve picked some popular recipes of Jules. Thanks for entering the giveaway! Definitely the GIrl Scout cookies!!!! I miss those terribly! Hey Jennifer–Good to see you again! Everyone is talking about GS cookies right now … so nice that Jules has recipes for them. 🙂 Thanks for entering the giveaway! I would love to make the macaroni and cheese. Haven’t had it in so long. I liked Jules on face book. Welcome to gfe, Tricia! 🙂 Now that’s classic comfort food … thanks for entering the giveway. I love coffee cake, and this sounds delicious!! Mmmmm. Just liked you on FB… looks like a great resource for GF wonders! Hi Christine–Thanks for the FB connection and welcome to gfe. 🙂 Thanks for entering the giveaway! I am new to all this are we supposed to post to enter every day or does just once do the trick? Thanks in advance. I follow Jules on Twitter. I would like to make her Pizza recipe! Hi Emily–Nice to meet you–welcome to gfe! 🙂 Who can resist good pizza, right? 😉 Thanks so much for entering the giveaway. Looks like a beautiful book! Hope to win! Hi Erin–Welcome to gfe! 🙂 Unfortunately this giveaway ended last night, but stay tuned for the final giveaway in this series, which will include a copy of Jules’ Free For All Cooking as well. I follow Jules on Facebook. What a fabulously appetizing looking cake!! Looks ooh so tasty too!